In looking at this chart, the more “yes” squares, the better the likelihood that the feedback will be provided and provided well. In analyzing these options for giving feedback to a manager, you can see that they all have their pros and cons. Unfortunately, there are more “no” squares than “yes” squares on the grid, so if you were ever wondering why there is often so much variance in manager quality, this perhaps provides insight. Managers have inconsistent channels and frequency of receiving feedback on how they are doing their job, and the quality of feedback is always in question. So you may have some great managers who just can manage people well without the feedback, but imagine someone who could benefit from feedback, and they get non-specific, time-delayed, low quality feedback. And if they don’t like it, they can take it out on their employees. As design, you can see that this is a failure. There are lots of amorphous, more-or-less unstructured channels for managers to receive feedback on their performance, and they all have flaws. If we were to improve the design, we’d make an attempt to address the “no” areas and enhance the “yes” areas. It’s direct, specific and immediate. That’s the good news. The bad news is that there is still the risk for an initially well-intentioned manager to respond poorly to the feedback and to respond consciously or unconsciously in a way that gets back at the employee providing the feedback. After all, the manager holds a lot of power over the employee. In performing management design, you need to design out this risk or mitigate this risk. Keep reading this blog for ideas on how to do this! The other problem area is that the feedback provider should actually be good at providing feedback. If the employee providing feedback naturally moves to using value judgments or generalizations when giving the feedback (“You are the worst manager ever” or “You always micro-manage me”), this is poor performance feedback. Given this way, it will almost guarantee a worsening of the relationship, and the risk is even magnified, as the well-intentioned employee trying to make things better just made things worse. However, this can be mitigated by helping the employee learn how to give performance feedback, just as managers can improve in providing performance feedback to their employees. So there is hope! In an upcoming series, I’ll provide strategies and examples for how employees can prepare for and give feedback to their manager. In my next series of posts, I’ll provide ways for the manager to set up the conditions for receiving feedback from employees on how well she manages them. For other channels, I believe that there are creative ways to improve designs give feedback to a manager, so keep reading this blog to discuss how to design-in better feedback channels to managers! 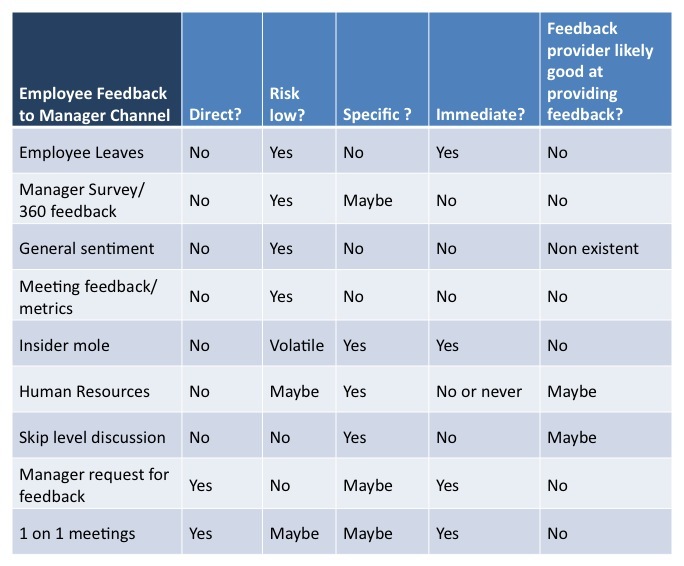 Your chart/List on the Employee Feedback to Manager Channel chart was very helpful. Glad you liked it Walt!